This compound of 3 cubes appeared in M.C. Escher's Waterfall, and has octahedral symmetry overall, i.e. the same symmetry as the cube itself. Imagine starting with 3 coincident cubes, then rotate each one 45 degrees around a different 4-fold symmetry axis (the axes through the centres of opposite faces) to obtain this compound. 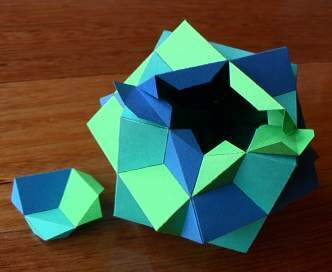 The model is provided in Great Stella's Polyhedron Library. 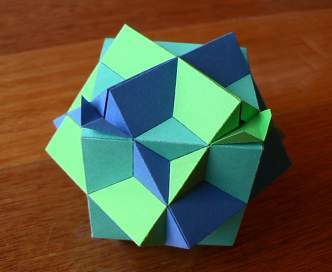 It can also be made as a partial stellation of the rhombicuboctahedron (partial because the triangle planes don't contribute). Its dual is a compound of 3 octahedra. Here is one of the three cubes, together with the central rhombicuboctahedron. You can see the cube has been rotated around a horizontal axis 45 degrees relative to the symmetry of the rhombicuboctahedron. This image matches the orientation of the main photo above. As well as being as stellation of the rhombicuboctahedron, here is another unexpected method of construction. 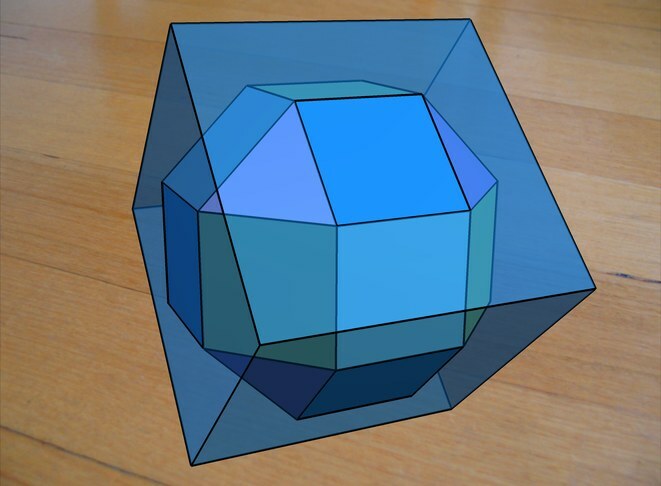 Augment a cube with pyramids to get the model shown here (left) and its dual (right). Enter Create Facets Mode and create two facets of this dual model as shown. 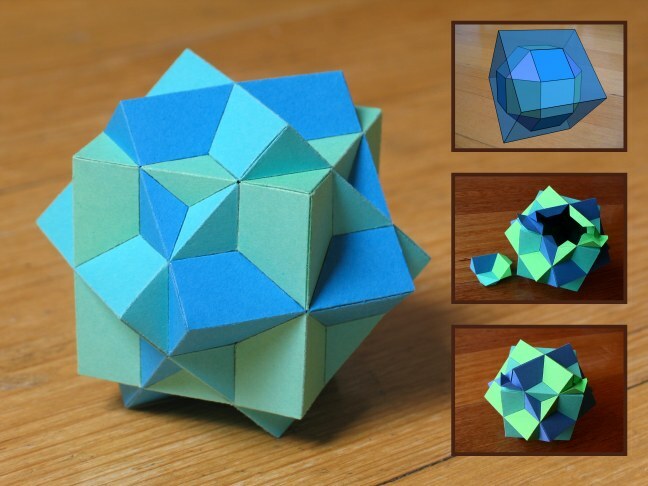 Then use "Poly→Create Faceted Polyhedron" to create the 3-cube compound. Finally use "Color→Color as a Compound" to color each of the three cubes in its own color. There are two kinds of net required for most of the model, one with two facelets, and one with three (each net being a single colour). Near the end though you often need to do things a little differently to be able to get the last piece in nicely. A good idea is to always print out an extra copy of each net, so that you can butcher them into smaller parts later if necessary. Here you can see a special part I made near the end to help finish the model. Here the final special part is glued in place, and then just two flaps remain to be closed. The trick is to try to be left with only convex edges to glue at the end, because they glue more easily when you can no longer reach inside with the tweezers.